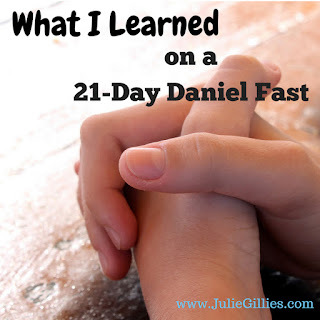 I recently participated in a church-wide fast. Typically my church engages in a 3-day full fast (no food at all for those who wish to participate and are medically able) every year in January. But this year the leadership felt we needed to change things up. It's based on the book of Daniel, chapter 10, if you're curious. Although I have fasted throughout the years, it remains difficult for me, because fasting always stirs up deep memories of painful hunger from my childhood. In that respect, this time was easier because I could eat as many fruits and veggies as I wanted. I particularly liked the longevity of this fast. It wasn't a simple 3-day thing. It was a persevering thing. It was a learning to deny myself thing. It was a get in God's face thing. 1. I reach out for food far more than I reach out for Jesus. This revelation floored me. Yes, God designed us to require food, but I noticed how often I absentmindedly reached for some morsel just to have something in my mouth. I'm amazed at the number of times I think about food. Good grief. God, help me desire you more than any earthly thing...even things that I truly need! 2. I can pray far more often. 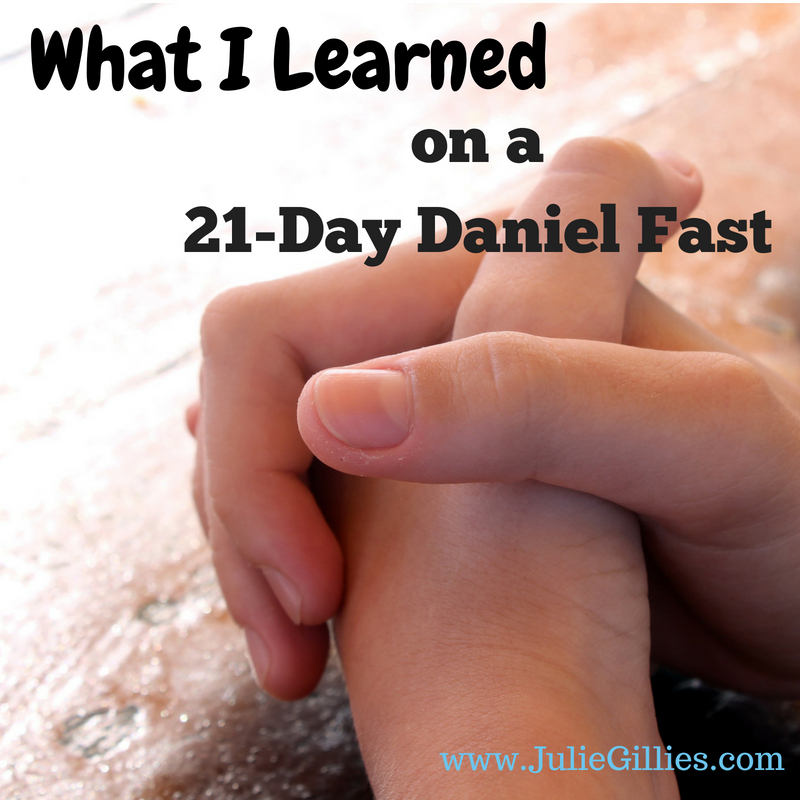 I profess to be a woman of prayer, but this fast taught me to pray even more. Every time I craved chocolate (or any forbidden food), I'd pray instead, and let me just say, I prayed constantly. If only my prayers were as continual as my cravings. Lord, help me to pray without ceasing! 3. A fast is warfare. I encountered an incredible amount of opposition from the enemy, particularly in my emotions. At times it felt like I was walking blindly forward in a raging blizzard, with a frozen, tear-stained scarf stuck to my cheeks. God tries our emotions (Psalm 7:9, "for You, Who try the hearts and emotions and thinking powers, are a righteous God.") Healing is a process, so I cry out, God, continue to heal my heart and emotions! 4. A fast is powerful. I've already begun seeing breakthrough in specific areas for which I prayed. But I'm expecting much more throughout this year. 5. To stop complaining--even in my thoughts. Let's face it, America has more food than most of the world. I felt chastised for even allowing myself to inwardly grumble about yet more veggies when so many others have so much less. We are incredibly blessed, and although I always thank God for my food, I felt a deeper sense of appreciation--and a reluctance to complain about eating beans for dinner again. Help me to cultivate a grateful heart, Lord! 6. The amount of sin still in my own heart. Fasting opens our eyes about ourselves like nothing else. Our hearts become tender and more acutely aware of God's still, small voice. That's a good thing. It's layer by layer that He reveals the truth to us, and it's truth we need to face, confess, and be free of. It's the truth that makes us free. (John 8:32) Thank you, Lord, for ever increasing freedom. 7. A fast is about trading the temporal for the eternal. When we willingly give up something we desire (lasagna and chocolate lava cake) for something we yearn to desire far more (Jesus), I believe it grabs God's attention. Yes, I gave up my favorite foods for three weeks. But in return, I touched God's heart in a powerful way--and He touched mine. I'm still processing everything I experienced in this fast, but I believe God accomplished great things, and I'm excited about what He has in store for me and my family. How about you? Have you ever participated in a fast? What did you learn from it?